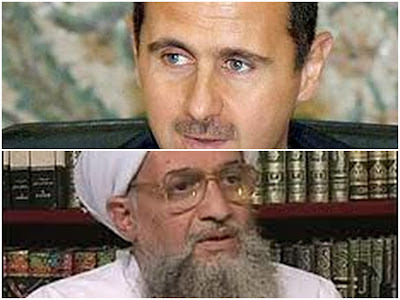 The love-hate relationship between Syria and al-Qaeda enthralls Arab political analysts. a statement by the opposition Free Syrian Army (FSA) requested a UN-mandated commission of inquiry to determine who stands behind Thursday’s twin bombings in Damascus and why. The statement denied the FSA was behind the blasts, accusing the regime instead of carrying them out to discredit the opposition. Of the 26 “terrorists” named in the Champress document, 20 are Tunisian, two are Lebanese, one is Lebanese-Palestinian, and the remaining three are one each from Libya, Egypt and Jordan. Champress says the official document with the full names, personal details, particulars and date of arrest of each of the 20 al-Qaeda and six other “terrorists” was submitted by Syria’s permanent UN representative Bashar at-Jaafari to the UN Security Council. The document shows most of the “terrorists” had infiltrated into Syria through Turkey and were captured in March. The FSA statement, for its part, said, “The illegitimate Syrian regime continues to kill and target unarmed civilians through bombings in Damascus and other cities. (Thursday’s twin) bombings in Qazaz are another desperate attempt by the regime to support its claims regarding the existence of ‘terrorists’ and ‘armed gangs’. “FSA members defected from regime forces to protect civilians, not to harm them. Ali Hamade, political analyst for the independent Beirut daily an-Nahar, focuses today on what he calls Syrian President Bashar al-Assad’s “love story” with al-Qaeda. Few people, he writes believed the Syrian regime’s narrative about the twin-bombings in Damascus, opposite the infamous “Palestine Military Branch” where regime opponents are interrogated and tortured. “Few expressed their condolences to Assad. Few believed the regime’s innocence of a crime that harmed ordinary civilians more than it hurt the regime’s shabiha militia or its Palestine Military Branch criminals. More recently, Hamade notes, didn’t Syria also manufacture “Fatah al-Islam” in Lebanon? It is an open secret, he says, that today’s al-Qaeda is “a gun for hire” – much as the Carlos terrorist group of the Seventies. Hamade says the February 2005 assassination of Lebanon’s Rafik Hariri marked the pinnacle of four-way cooperation linking Syria, Iran, Hezbollah and al-Qaeda. The head of Saudi-owned Alarabiya television news channel Abdul Rahman al-Rashed, also writing of Asharq Alawsat, says Damascus was heartened and couldn’t believe its ears on hearing US Secretary of Defense Leon Panetta tell reporters late on Thursday that intelligence indicates there is an "al-Qaeda presence in Syria… Frankly we need to continue to do everything we can to determine what kind of influence they're trying to exert there." The regime is a maestro at concocting terror scenarios to serve its own ends. It proved it in Lebanon by simultaneously assassinating Rafik Hariri and concocting the storyline of “Abu-Adass.” It confirmed in Lebanon again in 2007, when it planted Fatah al-Islam in Nahr al-Bared. It also proved it by gathering al-Qaeda volunteers from across the region before ensuring their safe passage to Iraq. It is now frantically trying to persuade the world to choose between Bashar al-Assad and Ayman al-Zawahiri.